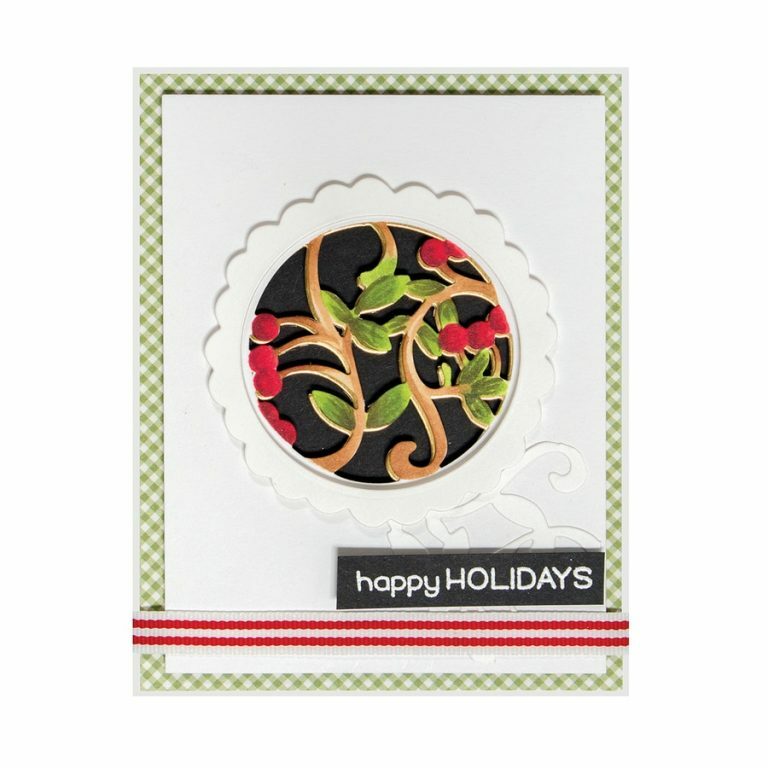 Hi, I’m Sharyn Sowell, sharing my new holiday die cuts. Home made is the essence of holiday joy, right? 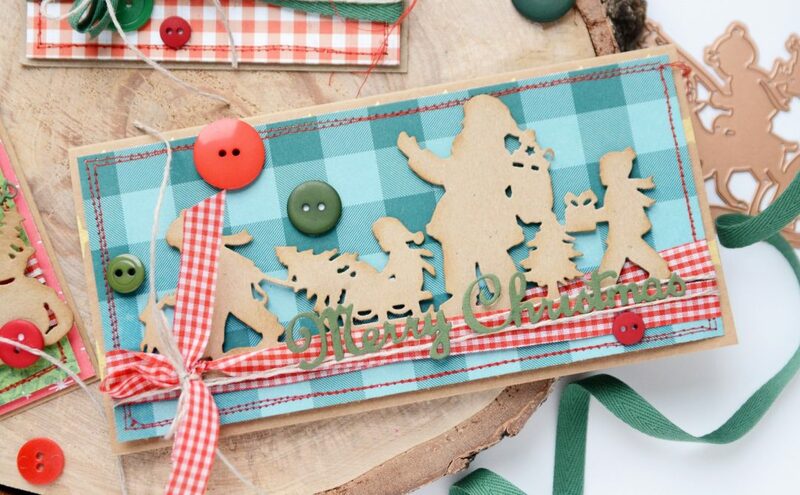 My inspiration for these dies was my own holiday strategy: slow down and make it simple and authentic. I embrace the happy memory-making creativity and refuse the myth of the superwoman perfectionist. I designed these dies for relaxed crafting. Let’s make the holidays stress free this year! Baking is my favorite holiday treat. Yours, too? 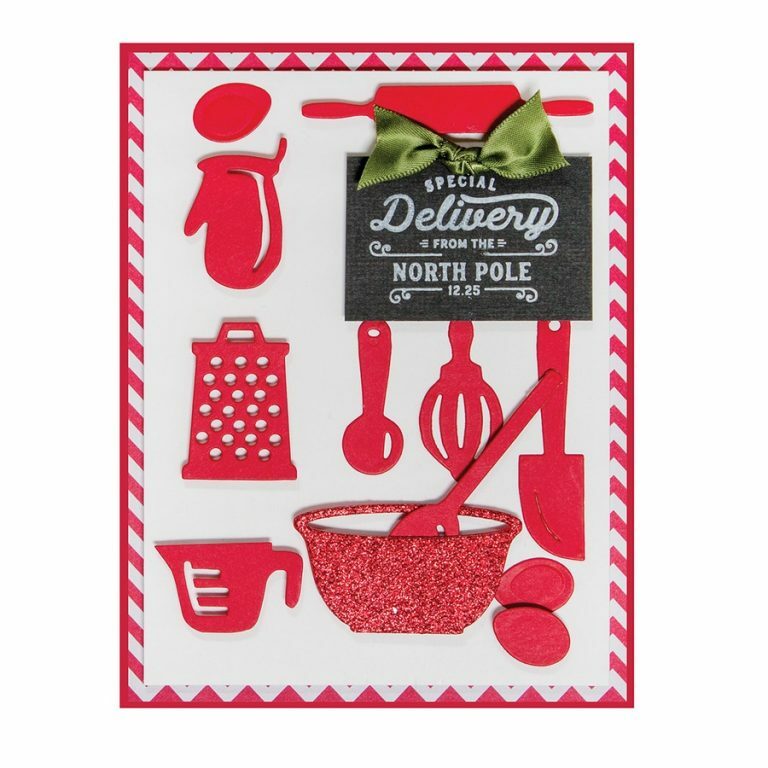 Pick up the Recipe Card Stamp & Die set. 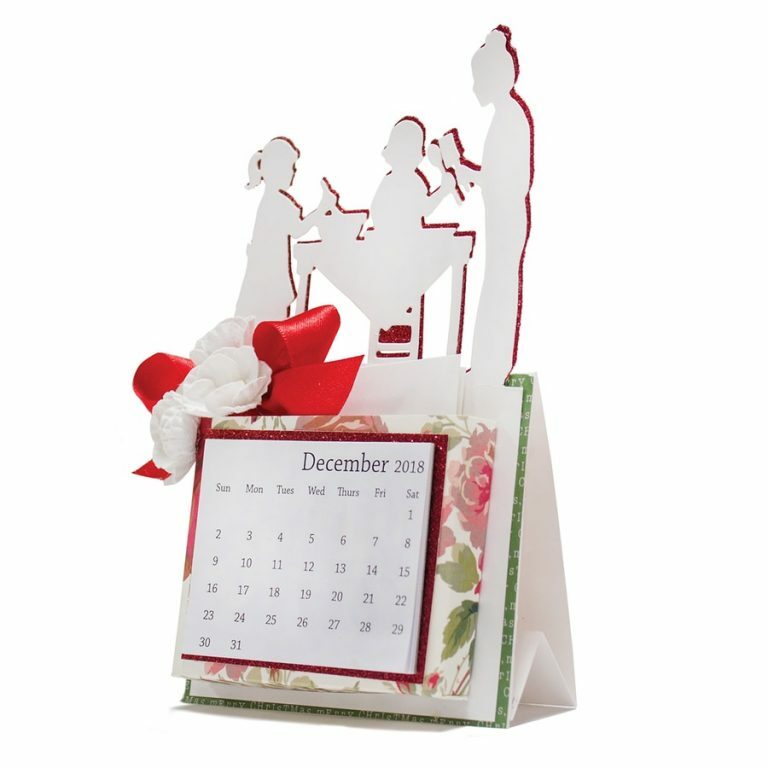 And by the way, this set isn’t specifically holiday so you can use it all year just by picking the right colors! 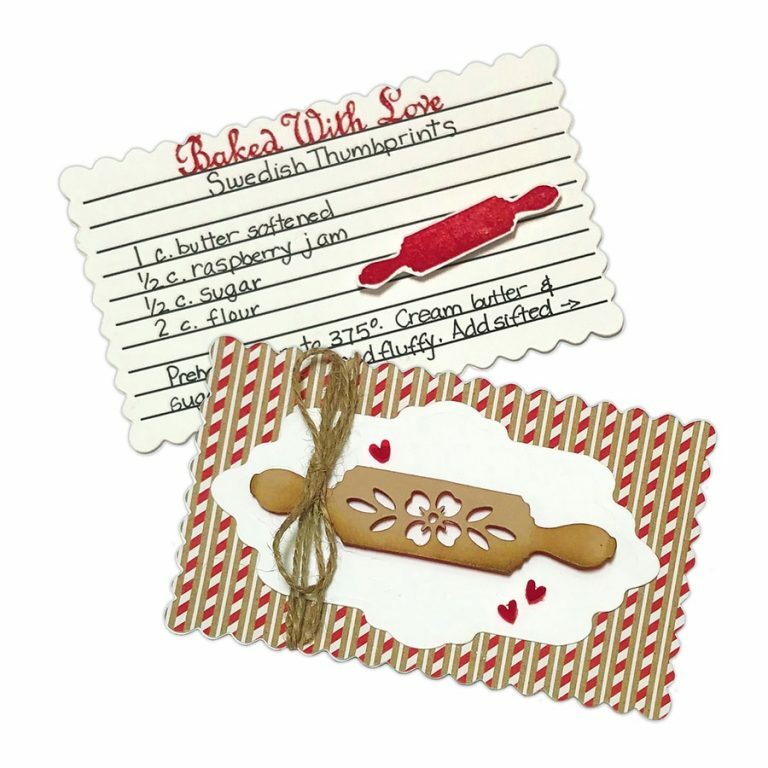 The scallop edged recipe card can be used alone as a tag or stamped as a recipe card. 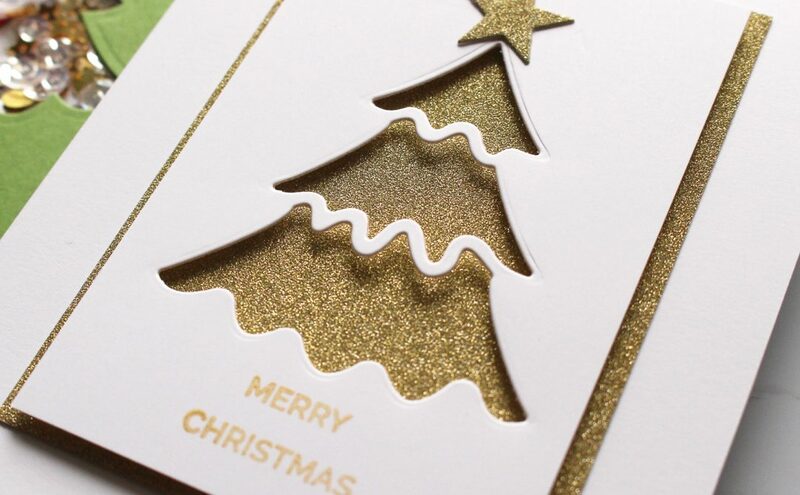 Why use an ordinary card when you can make one this sweet? The kids love to make their own cards and cookies but I don’t enjoy a mess. 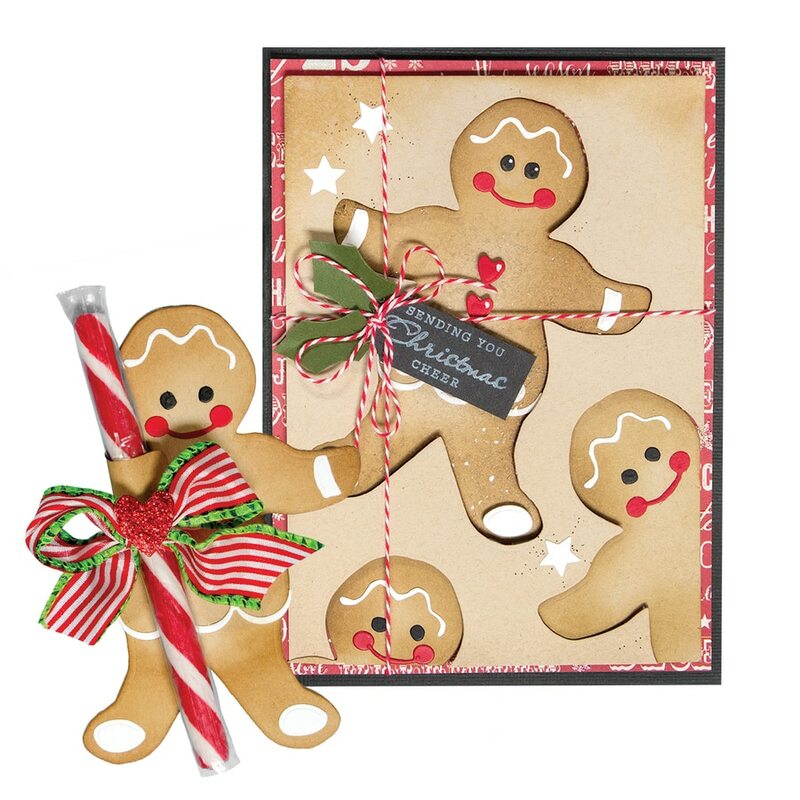 So Gingerbread Boy paper cookies are a great alternative. I cut a big bunch in various colors (there are mix & match options) and put them on paper plates. This simple idea, along with glue sticks, crayons and stickers, will be my cookie decorating party for the kids this Christmas. Are you with me for less kitchen mess? Look at the Let’s Bake! dies. Don’t tell anyone on my gift list, but they’re all getting Mason jars filled with mixes – trail mix, cocoa and candies for the non-cooks, soups and cookie mixes for those who like to stir up a little kitchen joy. It’s the perfect one size fits all gift and it fits my budget. Google “Mason jar mixes” and fill those jars, then let the kids decorate with these charming kitchen implements. Cookies are made of butter and love, right? 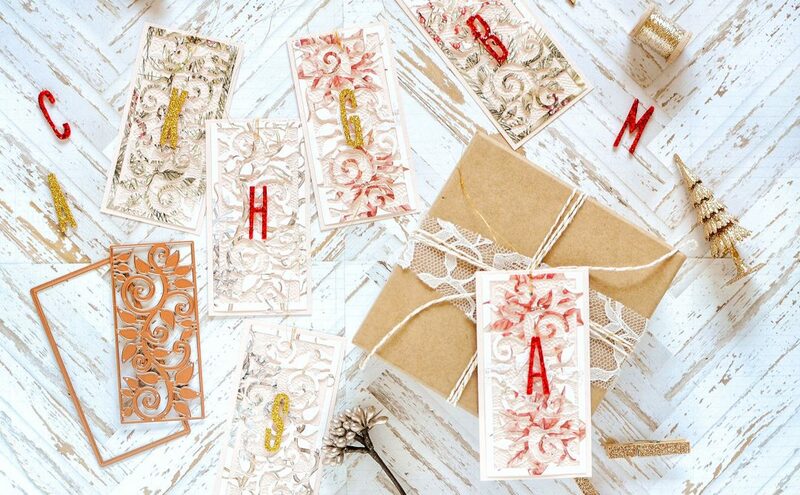 Love & Cookies will make sweet cards (or toppers for cookie bags or gift tags or thank yous!) 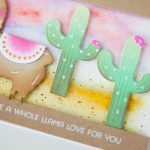 I love dies that I can cut in one color and use dimensional dots to stick onto a card front, making my crafting lightning fast because letting the die do the work makes it so easy in a time crunch. I’m planning to throw a party or two as usual this year so I’ll use the Mistletoe Doily to make a big stack of coasters. Everyone will think I’m clever and fancy but I know I will have saved myself cleaning time… no marks left from mugs or wine glasses! 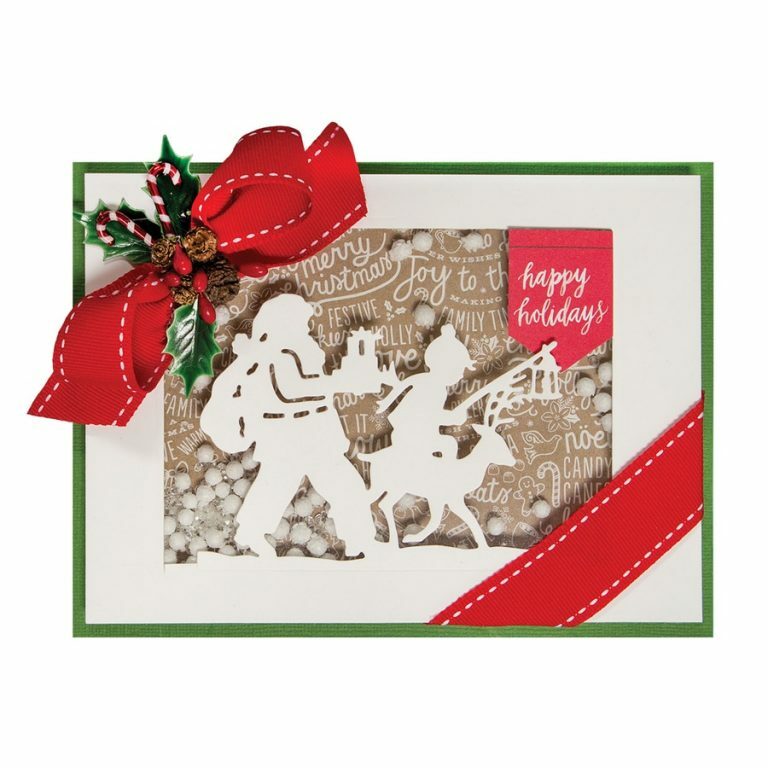 Lighting the Way is great for cards, but looks wonderful as a votive, tag, or gift wrap as well. I love to cut this image in white card stock and place on a solid red or kraft background for contrast. 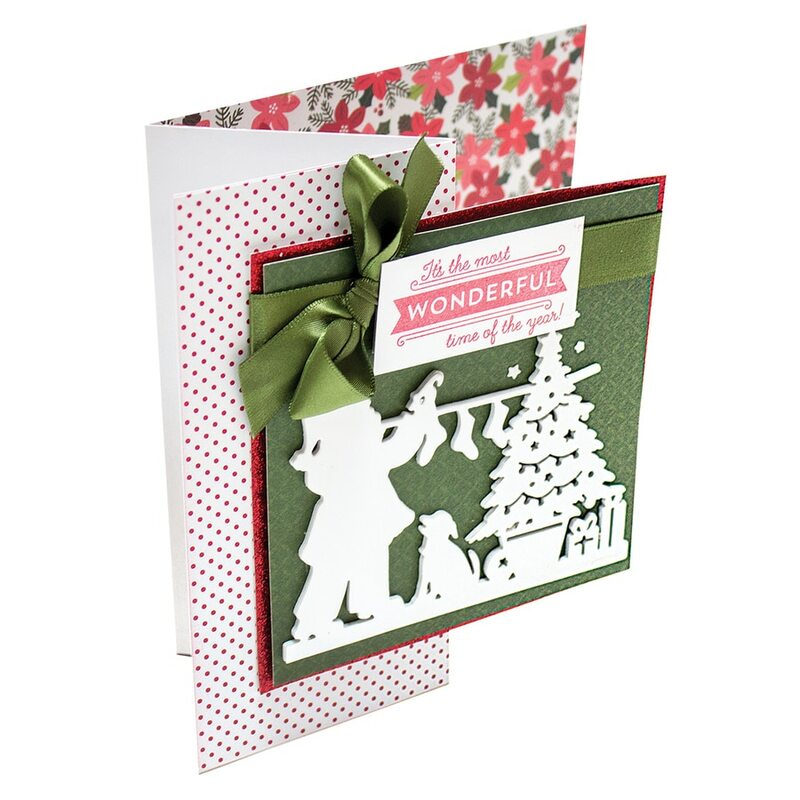 For invitations and holiday cards, I’ll use the Mistletoe Gatefold dies paired with a little glitter and ribbon. A simple panel card inside and I’m done. Again, simple and easy is my strategy! Letting the dies do the work works because everyone thinks I spent hours when it’s all down to a clever die. 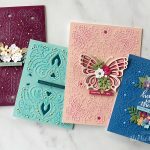 From Our Home to Yours makes a big batch of family greeting cards. 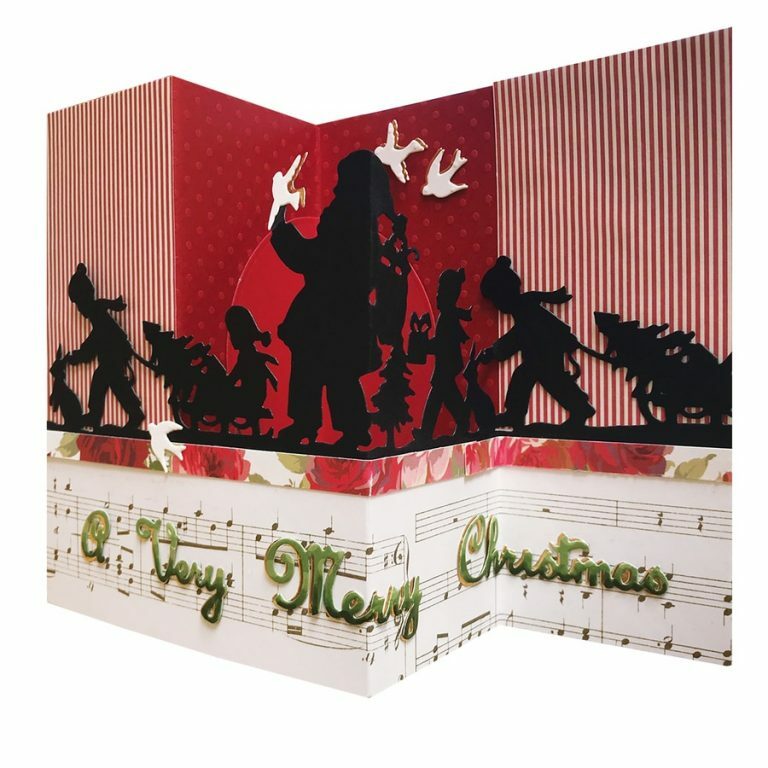 I know I’m not the only one who loves to send a greeting card but it’s got to be quick or I won’t actually get it done. 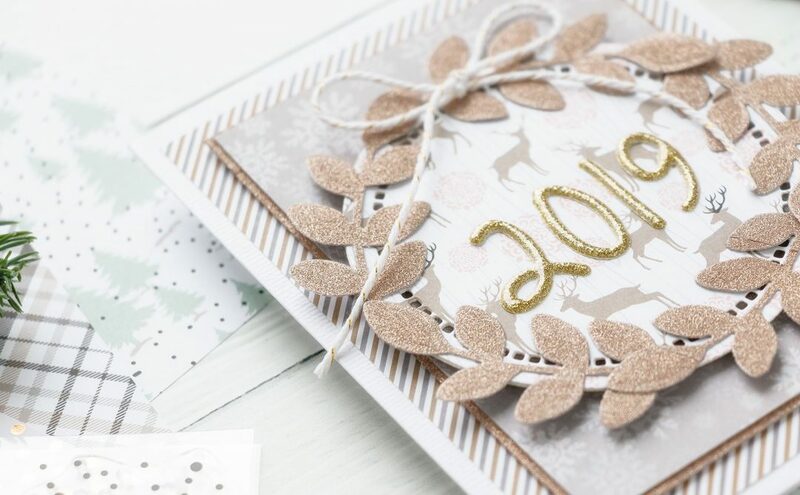 Mine this year will be cut from white card stock and mounted on bright deep red, with a candy-cane striped border and a red and white baker’s twine bow. 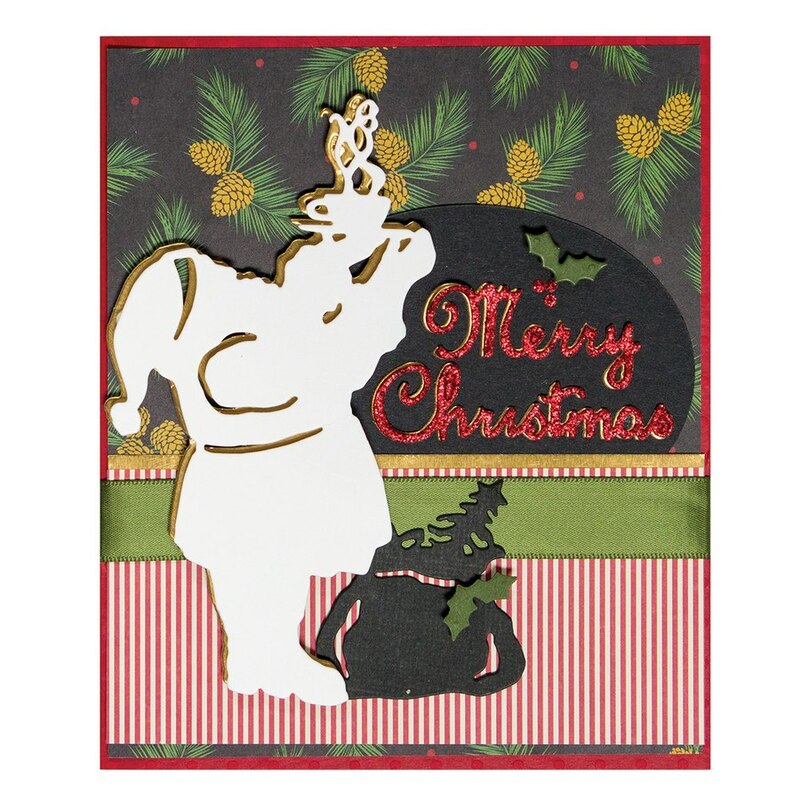 I’m using a vellum envelope, with another Santa on the inside of the envelope. The address with be written in front of Santa’s belt. Because real mail is so rare these days, I’m making it a point to sit down and actually write a note. Hand written notes will be my gift to many I know need encouragement this holiday. Hanging Stockings is perfect for those snail mail notes. I’m making bright fold-over cards as you see on the package. Just a short note inside and a Christmas stamp on the envelope are all I need to send a message that I care. Santa Parade is my go to package strategy for bargain wrapping. I’ll be using plain kraft paper with this die design repeated in a long parade across the package, with little dots for snowflakes and the to and from written in with the opaque white Signo ball point. Red and white baker’s twine complete the package. I’ll do the same but omit the twine for packages that go through the mail, and my friends will know it’s something special when even the outer wrapping is so festive. 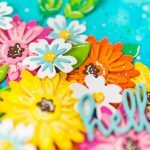 I cut the originals for these dies freehand using just a pair of ordinary scissors, and while I snipped, I thought of you. What will you make with them? I’d love to hear from you. Post your photos on Insta and tag me~ SharynSowell and #Sharyn Sowell or Facebook Sharyn Sowell Studio. I’ll be sure to keep in touch and respond. I really love the decorative kitchen gadgets, especially the rolling pin with the decorative cut outs. So cute.